Product and ordering information for Electronic Lift 240. Can be operated by remote control! Integrated motor and control system inside the support jack for easy adjustment. Highly precise scissor technology of 18/10 stainless steel. First compact design electric laboratory support jack! Space constraints in the modern laboratory fume hood can be quite restrictive, often making it cumbersome to adjust the height of equipment. 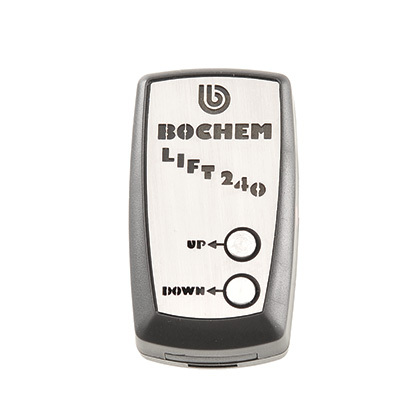 The new electric "Lift 240" from BOCHEM has an integrated motor and control system inside the support jack for easy adjustment. The extremely robust, high precision scissor technology of 18/10 stainless steel and the electronic components are protected with a durable bellows of chemically resistant PTFE. 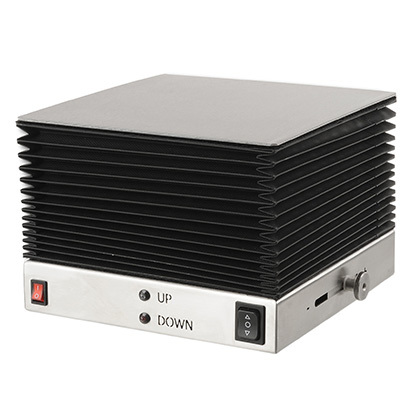 And since a fume hood is safest when it remains closed, the "Lift 240" can be operated by a remote control! The structural design of the electrical "Lift 240" is identical with that of the mechanical 240 x 240 mm BOCHEM lab jack. Maximum height stop can be manually adjusted via an external set screw.